After all the excitement of the Avengers landing in Perth the other week, you may think it's finally blown over and it's safe to roam our streets once again. You're wrong, dead wrong in fact. 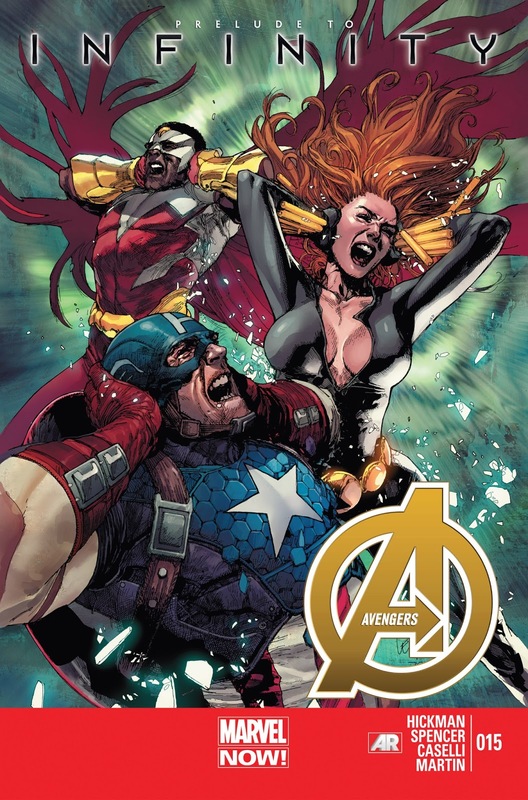 Avengers #15 by scribes Jonathan Hickman and Nick Spencer and master artist Stefano Caselli hit the stands yesterday and our fair city is the central setting once again. That's right, Cap, Thor and the rest of the gang are still having a super hero smack down out in St George's Terrace. You may want to watch out for flying Mjolnirs when you're on your morning commute into the CBD tomorrow. When we last left our heroes they had tracked a mysterious signal to the streets of Perth. After convincing Aussie hero Manifold that we are worth saving despite the high cost of beer the team teleported down. Perhaps a squad of aboriginal teleporters can be the remedy to our horrible taxi service here? Of course, this being the world of comics, they were ambushed and "immediate violent contact was made". Can I just say how happy it makes me to see that "Perth, Australia" location caption every time it pops up? There's no way this novelty will wear off for me. No way. The team have managed to claw their way out of the sea of alien communication bugs (yes, really) and are fighting tooth and nail to keep the nasties at bay. Unfortunately as Hawkeye observes they are literally increasing in numbers as they fight meaning the numbers game will always be on their side. 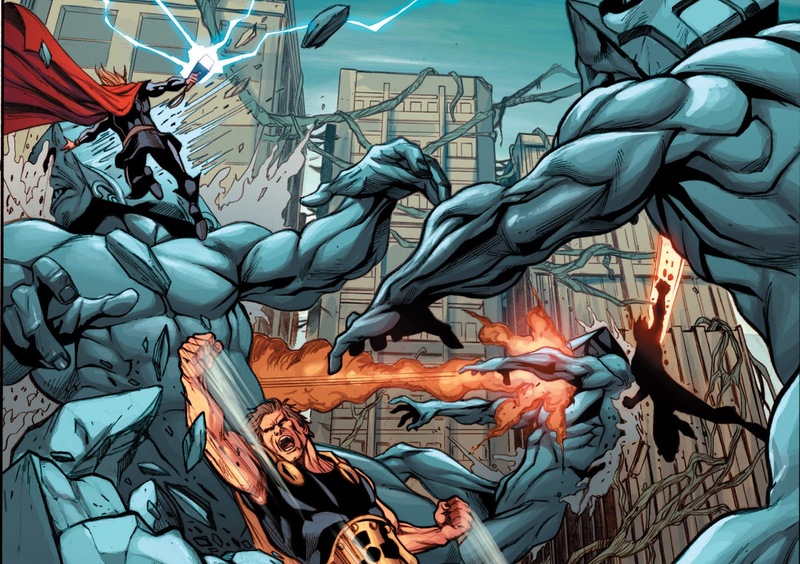 Add to this a squad of blue, block headed behemoths that even the mighty Thor is struggling with and things look pretty grim. 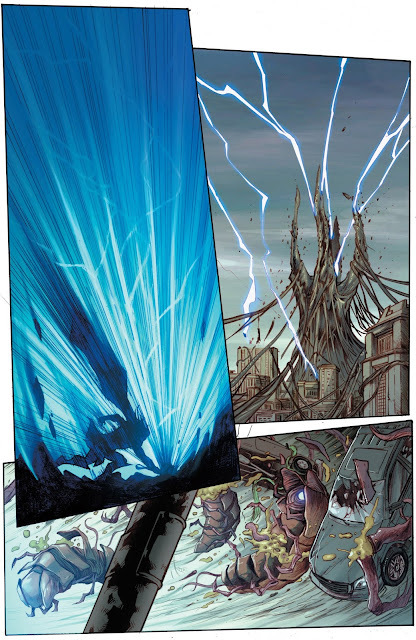 While this is all going on Bruce Banner (sadly not Hulked out.. yet) and SHIELD are trying to find a way to disable the bugs and working on figuring out what the hell the signal being produced in Perth is and where it is going. While the big brains are struggling for answers, those pesky bugs have successfully had their signal received by some manner alien robot out in space. Uh-oh. Back on St George's Terrace, the team are still struggling with their foes. Cap decides to improvise and tells Thor to use the alien antenna as a lightning rod. The Son of Odin does not need to be told twice and blasts what was probably the Bankwest tower with a huge lightning bolt! This turns the tide and the team womps the remaning invaders just in time to give us this glorious victorious hero shot. That's right, The Avengers are in Perth and looking like complete bad asses. 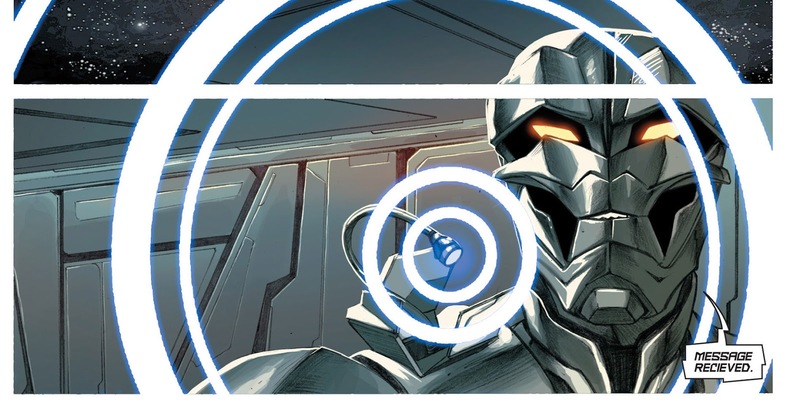 Captain Universe finally decides to show up and borrows Manifold for a little jaunt into space. 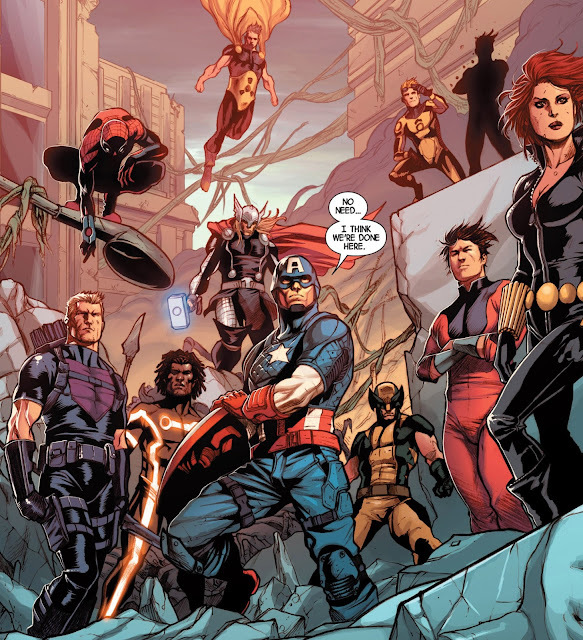 They end up.. somewhere and Cap goes all cosmic and vague on us again foreshadowing the upcoming chaos we're in store for. 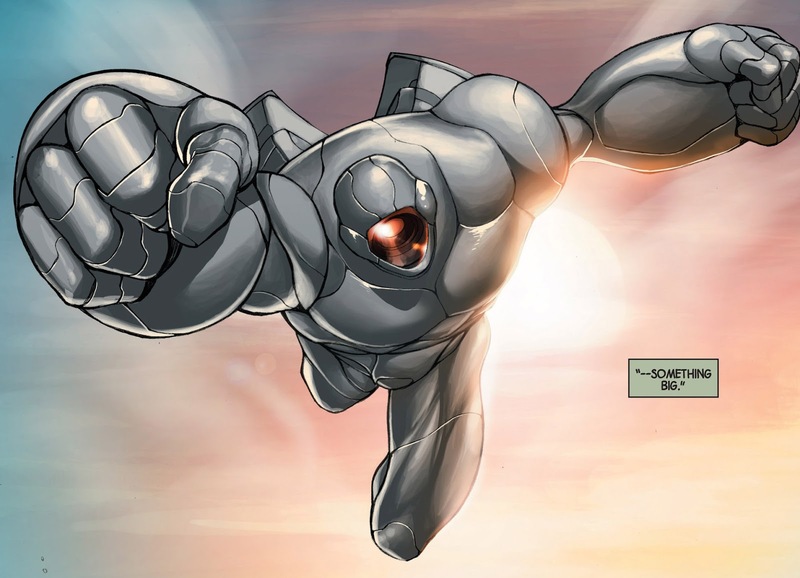 It's really great that Manifold is getting a starring role as of late. Not just pushed to the side and being a human Quinjet for Captain America and the rest. 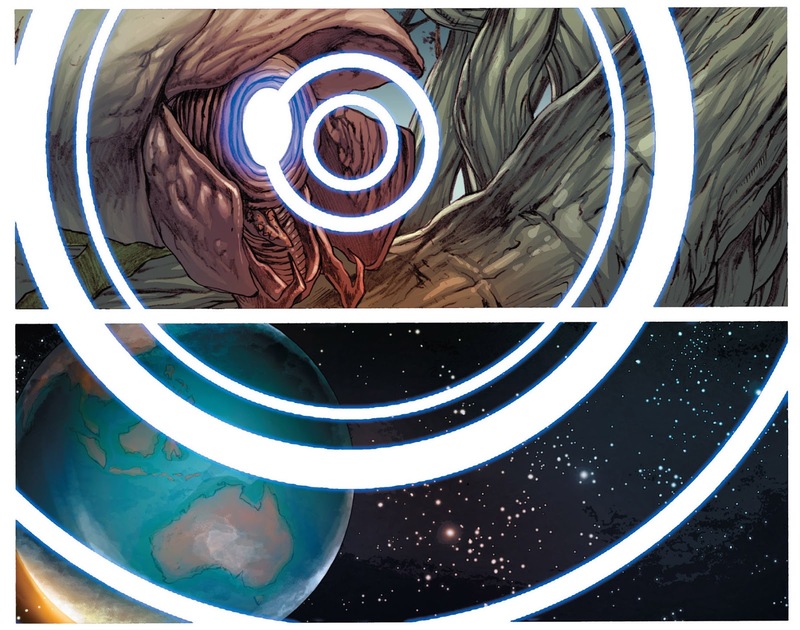 Back at SHIELD, Banner and co are tracking something heading to Earth at great speed. Based on it's trajectory, it's headed to Perth! That's right, whatever picked up the signal earlier is making a bee line for us as the issue ends. That means one thing, next month's issue will feature more Avenging in Perth awesomeness. Marvel are really showering us with love at the moment. Decimating the population with an evolution bombs, over running us with giant bugs and now sending a giant robot which is most likely a killing machine. 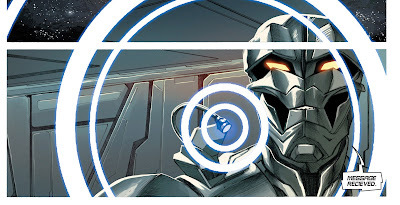 What'd we ever do to you, Jonathan Hickman? 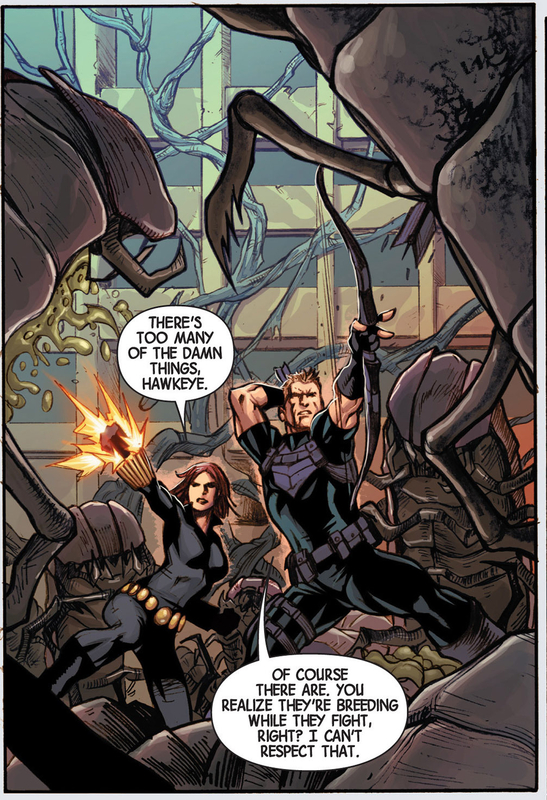 I'll be back with another recap when Avengers #16 drops in a couple of weeks. Until then, keep an eye out for stray star spangled shields flying around Hay Street Mall.